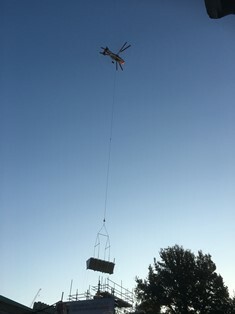 A helicopter flew in to Brighton at first light this morning to position two essential pieces of equipment on the roof of the historic Dome Concert Hall. Two dry air coolers were carefully lowered into position as part of ongoing work to restore and refurbish the Royal Pavilion Estate. Phase One of the Royal Pavilion Estate project involves improvements to the Dome Concert Hall, Corn Exchange and Studio Theatre. Reviving long-lost heritage features and creating new state-of-the-art facilities, key developments include a magnificent Corn Exchange viewing gallery, a dedicated creative space for workshops and rehearsals, and a new street-facing café opening out onto New Road. The lower end of Church Street and New Road were closed for around half an hour to allow the helicopter to fly overhead so that contractors could carefully position the units.